The Midwife of Hope River- Book Review and GIVEAWAY! I have to say that one of the coolest things about this blog is that sometimes I get free books. I was asked to do a book review for Patricia Harman's newest book, The Midwife of Hope River (oddly it was a former birth student of MINE who works in publishing who asked me to do the review!- it is a small world). I am so glad that she thought of me and asked me to read the book. I usually just read trashy mysteries (nothing wrong with that) so this was a nice change of pace. The book is fictional but written by a real life midwife. Full of a wide array of birth stories (and a little love story) it is an amazing little piece of midwifery history, American history, and the stories of women. The circumstances and customs surrounding birth change. But BIRTH, it's mechanics and it's emotions and it's simple powerful beauty- that stays the same. It was an amazing little book and I think you will love it too. 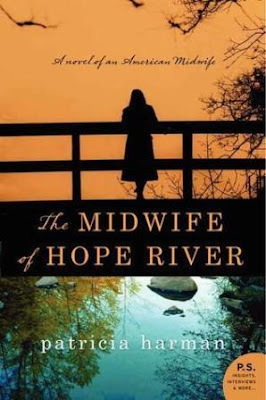 The Midwife of Hope River tells the story of a fictional midwife, Patience, and her life, her tragedies, her call to midwifery, and finally the stories of the many women she serves. She works in rural Appalachia amoung all different kinds of women, poor, rich, white and black, single and married, happy and miserable. Through the stories about these mothers and families, Patricia tells the story of the time. So often the history of women goes unspoken and unheard. I love that this book tries to tell that silent story and does so through the power inherent in women when they birth. Honestly, the thing that struck me the most as I read it was how even though the book takes place during the depression and in a very rural area, it was amazing how SAFE the births were. It is also pretty miraculous what a midwife can do with just a little knowledge and almost no medical equipment or training. I realize that the book is fictional, but having read other books by midwives, I think there is a lot of truth in it. People go on and on sometimes about how everybody should have a baby in a hospital. But some of these midwives worked in the worst situations- no plumbing, no electricity, no drugs for hemorrhage, high risk populations and women who were poorly nourished, and they STILL had some amazing results. This book also speaks to the calling that true midwifery really is. It is so much more than a job. So many women do this work that pulls them from their beds at night and the so often did it for free or very little. Another wonderful thing about this book was that I think it will bring some of the wonder and sacred power of birth back into the minds of regular people. I read lots of birth books, but most people DON'T. I am so glad that Patricia Harmon was inspired to write about midwifery within the context of a novel. I hope that regular people who don't really think much about birth, will pick up this book, read it, and then think just a little differently about how we are born after reading it. One of the simplest ways we can make change is just to slightly re-arrange the way that people think about birth (as pathological and medical) and make them realize that it can be a joyful dance between a couple and their midwives. If you would like to meet Patricia Harman on her book tour, check her out at these locations. The Midwife of Hope River sounds fantastic. The birth junkie in me is rejoicing! Sounds like an excellent read! I can't wait to read it! Crap- leave your e-mail for me! Please enter me! Jessi@knowbirth.com. It sounds interesting. I'd love the cahnce to win, but live in Europe. :-( Can I still enter if I agree to pay for postage myself??? Sounds like a book I'd love to read. I haven't read much in so long besides schoolbooks, it would be such a nice change of pace!! I don't even know what comment to leave, ha ha! I'd LOVE a chance to receive a copy and read. I'm so glad you loved the book! You're not kidding about midwifery being a calling. It's amazing that some women were able to live with midwifery being a job when they would often not get paid (depending on where they were practicing). PS I read trashy mysteries too. I knew I liked you for some reason! yes, please! I'd love to read and share. What a nice response to The Midwife of Hope River. Now you have to read my other books, The Blue Cotton Gown and Arms Wide Open: A Midwife's Journey, all contemporary and memoirs...but they read like novels. I wish you all well in the middle of the dark night. Patricia Harman, midwife and author. you did a great review which certainly inspires me to read the book...whether I win the give away or not! Love love love your blog! Still see the miracle in birth after 39 years of doing maternity nursing and home midwife assisting. I would love a copy, I'm looking for some good birth stories at the moment in the lead up to the birth of my first. I would really enjoy this book, I've heard only good things about it!! I am very excited to start my journey to become a midwife and for the birth of my second child, can't wait to read it!! So excited! I would love to give this book to a dear friend's daughter who is a mid-wife and giving birth herself for the first time this fall. This sounds like a great book...I would love to read it! Sounds like a great book! I can't wait to read it! This book sounds great! I have just finished "The Birth House" and loved it! As a doula who is headed towards midwifery one day, I am really inspired by these stories! My midwife just recommened this book! I would love to read it! I would love to read this! And it's great that she has others! This sounds like a book I would love to read. Can't wait! OOOH! I'd LOVE to read this! The last fictional story I read about a midwife had basically ZERO birth in it - how do you write a story about a midwife without talking about the babies she's catching? Thank you for sharing this!! It does sound like a wonderful book! I have been looking for good books to read during my pregnancy and The Midwife of Hope River and the author's other books sound perfect! I would love to read this novel! I'm fascinated by all things birth and breastfeeding. It makes me happy that Harmon chose to write this story as a novel. This looks like an amazing novel! Adding to my list of books to read soon :) I am 40 weeks and 5 days pregnant and ready to experience birth! I'm a midwifery student in Ontario, Canada and I would love to read this book! This sounds like such an amazing book! I'm loving the topics with midwives lately. One of my girlfriends did a homebirth (11 pound baby boy!) and I find it so fascinating and love that so many women and going back to homebirths! This sounds like a great book! Thanks for the opportunity to win a copy. Oh this would be so wonderful to read! I LOVE books like this, and I am SO in need of a good book right now! Sounds fantastic! I'd love to read this and share it with my birth junkie friends. I would be so happy to read this! I'm so glad you enjoyed this book! Thanks for being on the tour. I have a quick question about your blog! Please email me when you get a chance.